Sci-Tech watch, 6: Hot Dry Rock, engineered/enhanced geothermal electicity generation systems and the Montserrat case . .
Energy and its link to long term sustainability of development are major concerns for a Caribbean region that is largely dependent on imported oil for its commercial energy sources. Though, it must be noted that the the degree of official interest in alternatives to the volatile oil market in an era of concern about fossil energy use and impacts on global weather patterns tends to wax and wane accordingly as oil price surges or falls back, as well as, as the degree of interest (or otherwise) of political leadership similarly waxes and wanes. In the past several years, improved geo-imaging technology has allowed for a higher confidence in hitting a resource. In Montserrat’s case after a field investigation, it was suggested that odds of hitting a resource in a target zone were maybe 80%, quite up from the 20 – 25% industrial average rate of success for exploratory wells identified by the US NREL only several years ago. Over several months two wells were drilled, about 2500 – 3000 m. There was a bit of excitement in August, over noise and a steam cloud, which seemed on investigation to be due to injected water boiling off. Until recently, geothermal power systems have exploited only resources where naturally occurring heat, water, and rock permeability are sufficient to allow energy extraction. 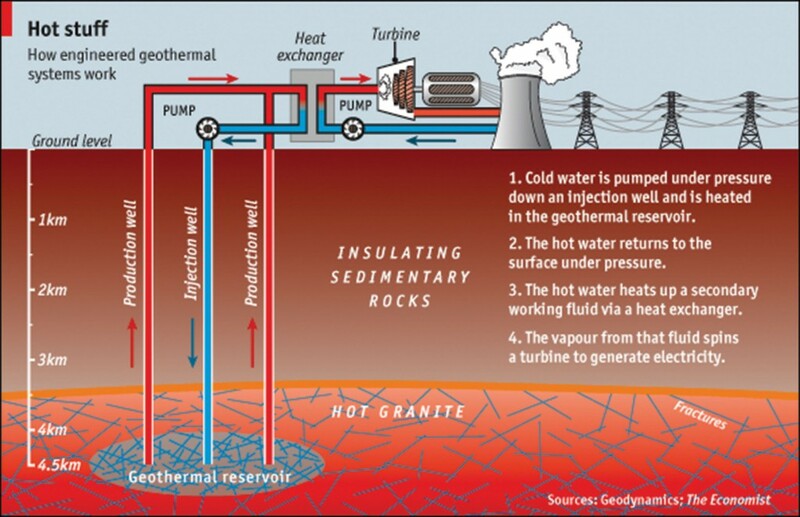 However, by far the most geothermal energy within reach of conventional techniques is in dry and impermeable rock. EGS technologies enhance and/or create geothermal resources in this hot dry rock (HDR) through ‘hydraulic stimulation’. 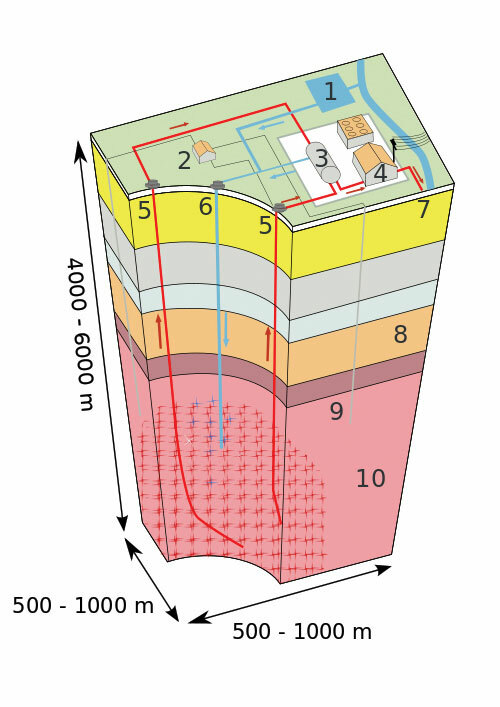 When natural cracks and pores do not allow economic flow rates, the permeability can be enhanced by pumping high-pressure cold water down an injection well into the rock. The injection increases the fluid pressure in the naturally fractured rock, mobilizing shear events that enhance the system’s permeability. As there is a continuous circulation, neither is a high permeability required, nor are proppants required to maintain the fractures in an open state. This process, termed hydro-shearing, perhaps to differentiate it from an equivalent procedure. Nevertheless it is substantially the same as hydraulic tensile fracturing used in the oil and gas industry. Water travels through fractures in the rock, capturing the rock’s heat until forced out of a second borehole as very hot water. 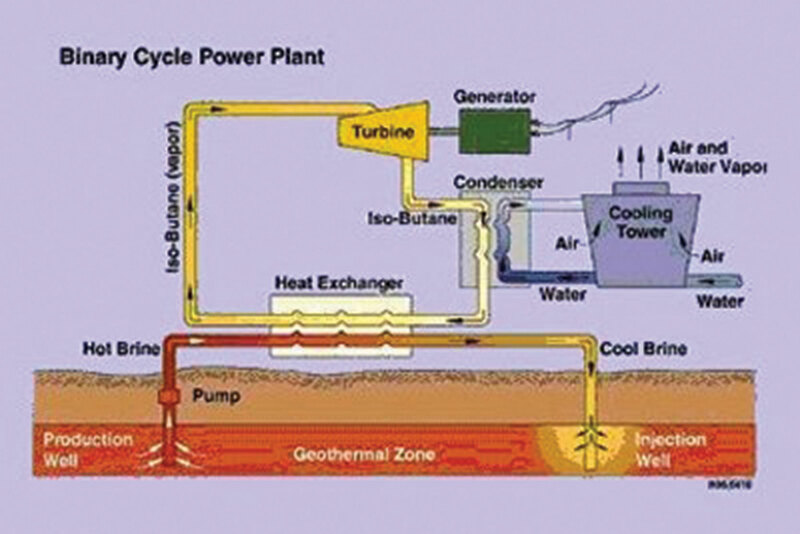 The water’s heat is converted into electricity using either a steam turbine or a binary power plant system. All of the water, now cooled, is injected back into the ground to heat up again in a closed loop. EGS technologies, like hydrothermal geothermal, can function as baseload resources that produce power 24 hours a day, like a fossil fuel plant. Unlike hydrothermal, EGS appears to be feasible anywhere in the world, depending on the economic limits of drill depth. Good locations are over deep granite covered by a 3–5 kilometres (1.9–3.1 mi) layer of insulating sediments that slow heat loss. EGS wells are expected to have a useful life of 20 to 30 years before the outflow temperature drops about 10 c (18 f) and the well becomes uneconomic. EGS systems are currently being developed and tested in France, Australia, Japan, Germany, the U.S. and Switzerland. The largest EGS project in the world is a 25-megawatt demonstration plant currently being developed in Cooper Basin, Australia. Cooper Basin has the potential to generate 5,000–10,000 MW. Indeed, there currently seems to be only one commercial development, in Landau, Germany. That one depends on a major government subsidy for exploratory energy initiatives. Others are research or exploratory. Commercialisation is at pioneering stages. Worryingly, in Dec 2006, a similar effort in Berne was brought to a halt as the expected earthquakes from injecting water in one well to crack and shear rocks to induce an artificial flow field went out of control. After quake hit the red light level, peaking at 3.4 ML, the development was stopped. The man in charge then actually faced criminal charges for damage and endangerment through triggered ‘quakes. Sounds a lot like what happened to seismologists in Italy recently, over failing to “predict” a quake. Nevis, next door to Montserrat, has explored GT, in the more traditional form, partnering with a speculative developer not on the list of a dozen or so. Hot fluids were hit, but development seems to have stalled. A cautionary tale, especially if one is looking at even more pioneering technology that rests on a field of scientific research that is still very much a work in initial progress. Another factor must be borne in mind, levellised costs to the producer then onwards the consumer for each kWhr of electricity — each “unit” — consumed or produced. The same cannot be said for EGS, at least for the foreseeable future . . . The equipment on the surface costs about the same for EGS as it does for conventional geothermal power, but the drilling costs can be twice as much or more for EGS. [–> Here in Montserrat, HMG has borne the first drilling and exploratory costs as a grant, and we seem to have hit resources at 2,500 – 3,000 m.] Dr Wyborn estimates that electricity from EGS could initially cost an additional $0.09/kWh over conventional geothermal, or about $0.19/kWh. [–> So we may be looking at costs at the plant of maybe US$ 0.10/kWh, and it is reasonable to suggest that this might double or thereabouts by the time we see it as consumers. That would of course still be significantly below current electricity costs, but it is not down at 4 cents. However, we are not talking about heavy industry as our focus for development, so it would help.] That would make EGS economic only in places with strong financial incentives, such as Germany, where operators of renewable-energy projects receive generous subsidies in the form of feed-in tariffs—currently $0.31/kWh for power from EGS. But not without rays of hope. He said that said morning he was advised the tests will be completed, “by the end of October.” He referred to the short term testing on which we were seeking information doesn’t give as much information. Finally, “I’m not engaging in any sort of discussion on what the results are because I don’t have anything in writing that tells me that this is the evidence,” he said. Given the concerns above, that caginess is understandable, but perhaps overdone. Surely, it can be stated in summary — a simple press release would do — that Well 1 of bore R was drilled dates A to B, reaching depth D, and so far it is dry and hot, measured temp being T. Well 2 was similarly drilled with similar details, and has a status S2. We are looking at the technologies for this kind of dry rock resource (with intent to use one well as fluid injector and one as production well, M metres away), and will provide more details as they come in. Or if in fact natural fluids have been detected, they are at such and so temp and flow rate to date. 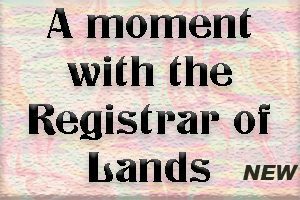 [The UK Government,] HMG has been saying that when the next phase of the geothermal development becomes available, they would seek private investor interest and the Montserrat Geothermal Power Co. (MGPC) [–> a corporation formed by a local pressure group, CRM] has for some time expressed an interest to, “on behalf of the people of Montserrat provide a bid for the geothermal power complex in response to an Expression of Interest (EoI) or any other legally authorised tender” . . . . The immediate concern here is that there does not seem to be a sufficient acknowledgement of the ongoing technical challenges involved and the narrowness of the global base of proved expertise with a seasoned, proved developer. On fair comment, under these circumstances, a too-quick jump to issues of ownership, profit-making and possible cost savings seems to run a risk of overlooking the need to have a mutually acceptable agreement to develop, operate GT energy and build up local technical capacity in a context of gradual technology and management transfer with a credible, seasoned operator. (Cf. remarks on effective practices for GT development in the linked Energy Policy document.) And if indeed we are looking at hot dry rock approaches with a lifespan limited sharply by the fairly narrow zone of heat exchange down below, that puts constraints on what is possible — economically, financially and technically. However, resort to such a plant is a double-whammy on efficiency, as (i) low temperature sets a lower physical limit on efficiency per the Carnot Theorem, and (ii) a heat exchanger is inherently a source of further inefficiency.